Can I leave them there? Yes. Can it be used online ? 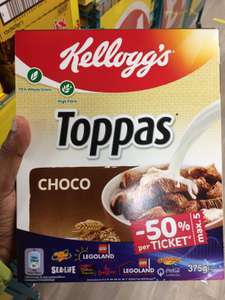 I found as well special k choco with the same offer. Thanks for your help I just don’t want to get there and it doesn’t work so think I will just have to have a plan B.
Hi Cookie, Here are the T&amp;C's, pretty sure they will work but would be happy to hear from people who have used them: # (EN) Buy one Kellogg’s pack, cut out the promotion coupon, when presenting the original coupon at the counter on site; one or more persons (max. five people) will receive a discount of 50% per person on the 1 day-ticket for a visit on that same day. Valid at LEGOLAND ® Billund Resort in DK (min. 1 child 3-12 years per adult), LEGOLAND Deutschland Resort, LEGOLAND Discovery Center Oberhausen and Berlin (adults only with accomp. child), Heide Park Resort (D), 12 SEA LIFE sites (D, NL, BE, FI, IT), The Dungeons in Hamburg, Berlin, and Amsterdam, Madame Tussauds Berlin, Vienna, Amsterdam and London, the Gardaland Park (IT) and Coca Cola London Eye. Valid until 30.6.2018. Participation 18+. The coupon cannot be combined with other offers, promotions,family tickets, annual tickets, pre-booked tickets, group rates and visits as a class, online tickets or any overnight packages. No cash payment or refund;coupon &amp; ticket resale are not permitted. I've just bought a pack as we are off to London next weekend - I know the 2 for 1 vouchers (national rail) work fine but I'm wondering if this voucher will allow for a fancier journey (champagne for example! Sun superdays offer - Incls Alton Towers, Chessington, Legoland or Madam Tussauds, Seal Life, Shrek. But the booking terms state within 28 days of receiving your form....... these could go back as early as mid feb (think it was the 20th) so thats more than double??? Seems like this shake up of how they are doing things is a much longer process!!! I emailed them asking when I would get tickets and they replied that they do it in band order and they have till 20th April to give them to us!!!!! Go there by 3PM and you will get pretty much straight in. Awesome buddy cheers for this!!! ​link broken do you have to be Costco member for this? 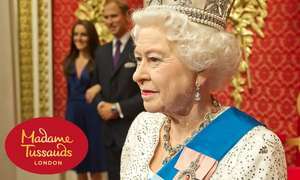 Your day will be gone queing for Madame Tussauds. Unless you get there at opening time I would seriously avoid. Is this still current does anyone know? WeQ4U app gets you the call for free from your mobile minutes. Help pls!! I'm a little confused. We are a family of 5. My husband and I and we have 3 children aged 13, 12 and 5. what are the best value for money tickets I should buy and how many?? As my second child is 12 do I need to buy a family ticket 1 child and another adult?? is that even an option. Any help will be greatly appreciated. Thank you in advance. It's 7p a minute and you can't get any other discount with the sale price. ​And this has worked at all 2for1 attractions you've been to? ​has to be by national rail I believe. ​Sorry if I'm being thick, I can't find London vauxhall in any of the ticket purchase apps. Is it called something else? Isn't it better value to get a Merlin card, and have unlimited access to these attractions and the theme parks well? Coca Cola London Eye? If it is sponsored next year by durex will you be calling it the Durex London Eye?? Took the kids last summer and they loved it but it was virtually impossible to take a photo of them without coke ads all over the pod. Great experience all the same. I have stayed at The Big Blue Hotel and can recommend it. It was very busy at breakfast but I doubt it will be that time of year. We stayed there as we were seeing a show at the Winter Gardens. You will eventually see this is about a family stay in Blackpool. Heat by the way. If this is your thing it sounds like a very good deal. You only get attraction tickets for the two adults? Still sounds quite cheap, though these dates are term time so better for pre-schoolers. I could wax lyrically about this but I won't. Saved for 2 wks. Sent away wks ago but still not received my tickets. Go away in 2wks. My brothwr sent his after me &amp; he has got his. I just remembered from my last trip, the tower is free to enter. You will need the voucher for the Eye and the Circus. Two separate attractions in is deal. I think it is going to arrive in the post. London Aquarium is of very poor value. I would rather spend my money on Chessington as the sea life there was much more superior! Looks like. It says "Sold out" and within an hour after posting on HUKD. As a poster, I missed out :-( . No London Eye included for one :( This is what put me off! Hmm planning a visit to the capital to do alot of the tourist stuff. I've had a quick look at the London pass. Seems lots of savings. Is there a catch? Which is the better deal? Thanks ThomasB09. 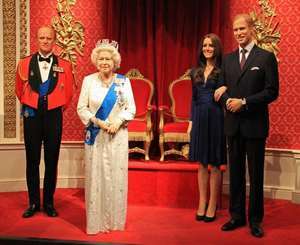 We mainly interested in going London eye + tower of london (not tower bridge) + madame tussauds. even the posted deal is not right for us really. Does London pass includes all of the above 3???? 1 day adult london pass £52 including unlimited travel on public transport and free entry to more than 60 attractions. london... is it not discrimination. its good deal but you need to buy train or paper travel card! The London one is good, we went on NY Day. My kids loves the huge shark tank and the Nemo/Dory tank. Is Sea Life any good? What's the price for an adult ticket? Every visit you make to Blackpool needs a very full wallet. should be paying you to go to blackpool ! Isn't this the normal online price though? 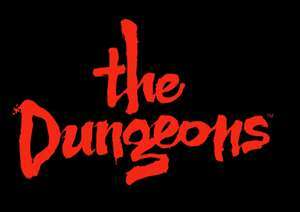 So basically, a child's ticket includes entry to the dungeon and the ballroom and adults have technically paid to get into some kids indoor playground?!?! Good price for 7 attractions but should be tailored to suit the age of the ticket holder.